Crash landing in a slimy mud hole, can sure make a rebel hungry. 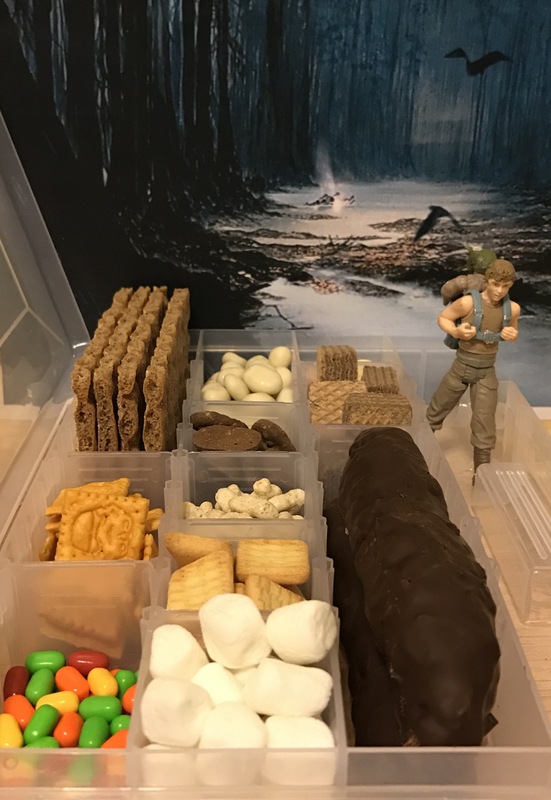 When you need something portable, nutritious and delicious (R2 is lucky he doesn’t taste very good), open your tackle box, and look no further than a space food stick. They can survive all the way from the tundra’s of Hoth to the swamps of Dagobah. It’s hard to tell what these sticks are really made of, so I decided to make them kind of like a chocolate-coated energy bar. They’ll serve you well while you’re camping out for Force Friday or waiting in line for an autograph at Star Wars Celebration. Even though they’re not Yoda approved, they taste like something out of a dream… Or maybe I’m just going crazy. 1. In a medium-sized bowl, mix together the oats, Rice Krispies, peanut butter, flax seed meal, honey, cinnamon, and vanilla. 2. Cover and place the mixture in the fridge for about 30 minutes. 3. Once the oat mixture is chilled, take a handful and roll into little logs or stick shapes and place them on a wax or parchment paper lined baking sheet. 4. Just before your pat mixture is done cooling, place the chocolate chips in a microwave-safe bowl or glass. 5. Microwave at 30 second intervals, stirring after each interval until chocolate is completely melted. 6. Using the back of a spoon, paint each space food stick with melted chocolate, making sure to coat each side. 7. Place the baking sheet into the fridge and allow the chocolate to harden for about an hour. 8. Enjoy while looking for a great warrior. This entry was posted in Recipes and tagged space food sticks by blastpointspodcast. Bookmark the permalink.